Clearock machines are made with stainless steel body fitted with imported housings and motors from Italy. All motors heart of vacuum cleaners comes with manufacturing defect warranty and suited for wet and dry applications. All models are designed and suited for commercial and industrial use. Three motor is of 3000w, suction power with 230 bar with 60ltrs tank capacity. Material collected deposited directly into a disposable paper bag or cloth bag, directly into the Canister. The Motors are protected by a 14" diameter filter assembly. All mounted on Caddy Type Trolley with two 200mm Rear Wheels and twin 75mm front swivelling castors with an integral Pushing Handle. Suitable for use on 240 volt Single Phase 50Hz. Make sure that the power supply is identical to that shown on the voltage plate. Assemble suction hose, wards and suitable tool. Remove all the floor mats, loose items in a basket from the car.Dry Vacuuming to all interiors to remove the dust particles, garbage from the car. Seats-use proper attachments to clean crevices(including the area beneath the seats, around the pedals. Vacuum the floor mats separately. Clearock - Vaccum Cleaner - Three motor Features: Clearock machines are made with stainless steel body fitted with imported housings and motors from Italy. All motors heart of vacuum cleaners comes with manufacturing defect warranty and suited for wet and dry applications. All models are designed and suited for commercial and industrial use. Three motor is of 3000w, suction power with 230 bar with 60ltrs tank capacity. 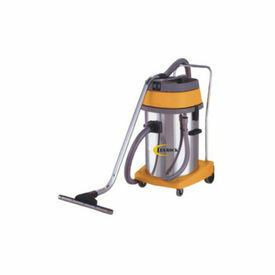 With a strong responding motor, this machine has a very ideal effect in dust and water vacuuming. it has multopurpose attachments that fix to the main unit easily. The product is suitable for large scale work shops, factory premises, malls, and office buildings and other large scale public places Specifications : Motor 3000w 1,2,3 motor option Steel tank 60lts Made in Italy Large flexible hose Sp tool for car How To Apply : Wet and Dry Vacuum Cleaner This model is powered by three motor 3,000 Watt direct Air Flow of Rate of 106 L/s supported on a 60 litre Stainless Steel Canister Vacuum Suction 250 bar Material collected deposited directly into a disposable paper bag or cloth bag, directly into the Canister. The Motors are protected by a 14" diameter filter assembly. All mounted on Caddy Type Trolley with two 200mm Rear Wheels and twin 75mm front swivelling castors with an integral Pushing Handle. Suitable for use on 240 volt Single Phase 50Hz. USE INSTRUCTIONS Make sure that the power supply is identical to that shown on the voltage plate. Assemble suction hose, wards and suitable tool. Connect suction head on fank so that mains cable is opposite to suction hose connection HOW TO CLEAN Remove all the floor mats, loose items in a basket from the car.Dry Vacuuming to all interiors to remove the dust particles, garbage from the car. Dash board with console Floor Carpet Seats-use proper attachments to clean crevices(including the area beneath the seats, around the pedals. AC Vents Boot area Vacuum the floor mats separately.